The CPMR took part in the successful ‘1st Balkans & Black Sea Cooperation Forum’, held in Serres (Central Macedonia – Greece) at the end of May, expressing its support for the Forum as a means of encouraging collaboration across the wider Black Sea area. 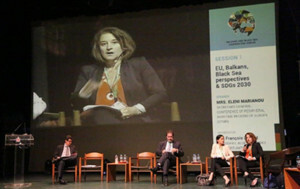 CPMR Secretary General, Ms Eleni Marianou, who is a member of the Forum’s Scientific Committee, took part in the first session, together with the Organization of the Black Sea Economic Cooperation (BSEC) and the European Commission, entitled ‘EU, Balkans, Black Sea perspectives & SDGs 2030’. During the debate, she outlined the CPMR’s expertise and added value in territorial partnerships and cooperation and the role of regional and local authorities in implementing the SDGs 2030. Speaking about the CPMR involvement, Ms Marianou said: “This Forum complements the vision and ambition of the CPMR and its Balkan & Black Sea Commission (BBSC) to encourage cooperation and dialogue between the different actors and stakeholders in the region. At a particularly challenging period for the Balkans & Black Sea area, the CPMR and its Member Regions are glad to be actively involved in this endeavour. The Forum concluded with a Final Declaration entitled ‘Cultural Tourism, a key to Sustainable Development’, which was supported by the CPMR as a strategic partner. The Forum was preceded by the 2017 CPMR BBSC General Assembly, where the Commission’s member Regions gathered to develop a business plan for 2017-2019, which will coincide with the Bulgarian and Romanian Presidencies of the Council of the EU. During the meeting, Ms Marianou underlined the fact that the Balkan & Black Sea area has an important role to play in helping to build a positive future for Europe.